Pork belly. Those two words open up vistas of pleasure for most carnivores. Who would have thought that something so simple sounding could deliver so much pleasure? The antithesis of the push for lean dry tasteless meat that blighted the menus and school lunches of my eighties childhood, belly is full of interest and excitement. And at lunch, well, it’d be a sin to pass it up. Meemalee, Mr Noodles and I were trying out 28-50. Named for the latitudes between which most wine is grown, it’s the more casual, wine-focussed, sibling of Texture. With the stripped back simple wood tables and underground space, there is something of both Terroirs and Vinoteca about 28-50. The focus here is on the balance of food and wine with the former well cooked and the latter available in all sorts of different measures, from 75ml to a whole bottle. Perfect for those who like to taste different wines and not roll out at 2pm, pissed as a fart. A wide selection of good wine by the glass (another similarity with Terroirs and Vinoteca) meant I got to pair my gazpacho and pork belly with a glass of lovely crisp, balanced and tasty Aussie Riesling. The perfect foil to the unfolding fleshy delights of my pork belly. This came in a couple of thick strips, tender strings of meat barely held together by glutinous, soft, almost sweet fat that luxuriously slipped down as I ate. Two strips of flash fried pork crackling, essence of pork blasted into crispy little blisters of flavour, were precariously balanced on top. Nestled sweetly in between those meaty strips, a single slice of pungently intense morcilla sausage, its bold brassy flavour belying its diminutive size. All this might have been too fatty and intense were it not for a bed of lightly pickled cabbage. The key here was the light touch. There was no tear inducing sinus blitzing on first bite, it just tickled your tongue and gently stripped away the fatty coating of pork before it swamped your taste buds. And the gazpacho? Good, light, fresh with a tomato sorbet in the middle. It was everything a gazpacho should be, but really just paved the way for that belly. One hit of maximum belly was enough to keep me going for a couple of days. You don’t want to dilute that sort of pleasure. I’d come here again, only this time I’d spread it out over an evening – plenty of wines by the glass and lots of charcuterie and starters. It’s really more that kind of place than a lunch spot. Even an hour felt rushed and we missed dessert as time ran out. That is not a criticism, more a recognition that it’s worth investing a little time to enjoy the food and wine here. I’m going again TODAY! I’m going again TODAY! 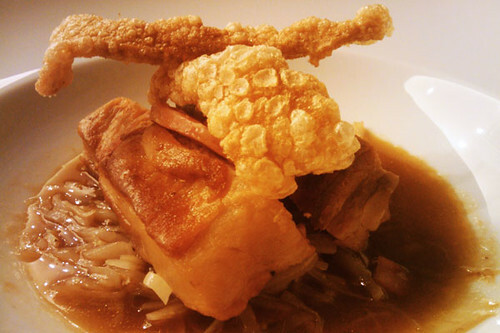 Pork belly – it should be the new ‘burger’ if you know what I mean. I enjoyed it here, I enjoyed at Koya and I always enjoy it with Chinese food! I also liked the duck rilettes that I had to start. Special mention goes to the gherkins that came with it. 28-50 is definitely somewhere I’d return to – a good spot by meemalee. @Mr Noodles – I do know what you’re talking about and yes, we should start exploring the myriad different bellies on offer across the Big Smoke. Those rilettes were prtty good looking. Shame my phone wasn’t up to good pics. Ooh pork belly, have gob, will travel. Unfortunately, being a total heathen, I cannot convince my tastebuds to like wine but that leaves more room for grub anyway, I say. Yep, there’s definitely drool on my keyboard. @Sasa – Thanks. Dontchya just love the stuff. You find it everywhere and everyone does it so differently.